Are you ready to leave your braces behind? Are you ready to consider braces, but worried about having wires on your teeth? They can be an uncomfortable obstacle and unsightly for your smile. We all know braces cause wearer discomfort and irritation. They can also cause jaw pain and abrasions on the inside of your mouth. Fixing them onto and removing them from your mouth can also be painful or uncomfortable. There are better alternatives to this outdated process. While braces have their place, there are less restrictive ways to shape your smile. One of the wonderful things to come out of technological advancement is ClearCorrect. A better alternative to braces. ClearCorrect aligners are placed on top of your teeth like a cap and line up your teeth over time. How do they work? Let’s explain the process. In order to get these aligners, your dentist will first scan your teeth. They will make 3D models from these scans to outline every step and your end result. This will help you visualize your ideal smile and witness the process. Then, every 2-3 weeks, you will receive a new aligner. As you go, your teeth will gradually be moved into place. The added benefit of ClearCorrect is that you can remove your aligner when needed. When you’re eating or brushing, they can easily be set aside. Otherwise, you are advised to wear them for up to 22 hours each day. There are long-term benefits to using aligners. After having your teeth shaped by them, you’re less likely to get food stuck in your teeth. It prevents premature wear and visible aging. Your teeth will provide you with a wonderful smile that can help you feel confident and beautiful. Marquette Dentistry in Houston, Texas, is a provider of ClearCorrect. Their qualified professionals are well-versed in how ClearCorrect aligners work. They can guide you through the process of getting your aligners and helping you achieve your ideal smile. With the help of the Belcher family and their wonderful assistants, you can walk out of their offices feeling great about your teeth. At Marquette Dental, it is their mission to make sure you are treated like family. They are ready to answer any questions you have and help you be comfortable during the entire process. They have financing options available for all of their clients. Why invest your time and money in braces when you know how uncomfortable they’ll make you? Leave your braces behind. After you have read this article, we hope we can convince you! If you have any interest in this process, you can visit Marquette Dentistry’s website for yourself. 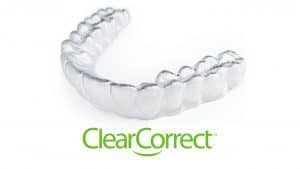 Here you can view all of their pages on ClearCorrect aligners. You can also contact them at (832) 786-4406.